Even though Martin Brodeur has talked about reaching 500 for several weeks, actually getting there overwhelmed him. Now that Marty Brodeur has climbed Mount 500, a place where only one other NHL goaltender has traveled, it is time to ask a few pertinent questions. 1. At age 35, and with four more years remaining on his contract, is there any doubt Brodeur will catch Patrick Roy’s all-time record of 551 regular-season wins? 2. 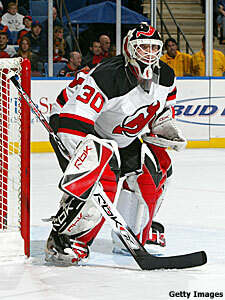 While we’re on the subject of Saint Patrick, who will go down in history as the better goalie, Roy or Brodeur? And does anyone else deserve consideration? 3. Will there ever be another goalie who wins 500 games? Or, for that matter, 600? Record-setting events have a way of bringing into focus the magnitude of a player’s accomplishments. But also, it has a tendency of blurring the past. That certainly was the case Saturday night when, after three failed attempts to scale Mount 500’s treacherous slope, Brodeur traded in his millstone for a milestone with a 6-2 victory over the Flyers in Philadelphia. Since joining the Devils full-time in 1993-94, Brodeur has averaged 63 starts and 38 wins a season. And since taking over as the Devils’ starter full-time in 1995-96, those numbers increased to 66 starts and 41 wins a season. Even though Brodeur has talked about reaching 500 for several weeks, actually getting there overwhelmed him. It is that competitive edge that separates Brodeur from the hundreds of goalies that have come before him. Even in his milestone victory, with his team leading by four goals, Brodeur made a diving catch of a Daniel Briere shot into a yawning net. Flyers goaltender Marty Biron said most goalies share Brodeur’s competitiveness, but very few can maintain the mental sharpness Brodeur has shown for the past 14 years. The question is whether Brodeur can sustain that level of concentration long enough to pass Roy’s record. Devils General Manager Lou Lamoriello certainly thinks so since he gave him a contract extension that includes four more seasons after this year. Assuming Brodeur plays through the end of his contract and averages 30 wins a season – a modest estimate by his standards – he would break Roy’s record sometime late next season and, at least theoretically, finish his career with nearly 650 wins. Not surprisingly, Brodeur would like no part of what will become an inevitable debate: Who will be remembered as the greater puck stopper of all-time, Brodeur or Roy? Statistically, they are very close. Brodeur is 500-273-105 with 15 overtime losses. Brodeur has 92 career shutouts. Brodeur’s career goals-against average is 2.21. In the playoffs, Brodeur has gone 94-70 with 22 shutouts and a 1.93 GAA. Roy went 151-94 with 23 shutouts and a 2.54 GAA. Brodeur has won two Vezina Trophies and three Stanley Cups. Roy won three Vezinas, three Conn Smythe Trophies and four Cups. So who was better? As we mentioned earlier, recent history tends to blur the accomplishments of the past. “I think Patrick revolutionized the game of hockey by playing the way he did and achieving what he achieved,” Biron said. “Patrick brought in the butterfly and everybody went to that. Marty is the total opposite. Having played with six-time Vezina winner Dominik Hasek in Buffalo, Biron thinks “The Dominator” also deserves a place in hockey history. Devils assistant coach Larry Robinson, who played in front of both four-time Cup winner Ken Dryden and Roy, said there is no question Brodeur belongs in their class. Which leads us to this final, pressing question. Are any of today’s goaltenders destined to win 500 games? Or, for that matter, 600? “I don’t think you or I will ever see it,” Robinson said. Around the Atlantic -- With their win over the Penguins Saturday night, the Rangers moved into sole possession of first place in the Atlantic, a position many expected them to be in at the start of the season. "If anything, we still feel like we're playing catch-up,” center Scott Gomez said. “We don't feel like we've done anything. I think Brendan Shanahan said it best: 'We want to start separating ourselves now.'" … The Flyers’ Simon Gagne is starting to see a light at the end of his concussion tunnel. He rode the stationary bike twice last week and on Sunday skated for the first time in more than a week. His next step is to practice with the team, which could come after Thanksgiving. … The Islanders are getting healthier by the day. Last week they added veterans Bryan Berard (groin) and Bill Guerin (eye) to their lineup. Guerin said the blurred vision that kept him out of one game reminded him of his teenage years. “It's kind of like you're sitting in your car and all your windows are fogged up, like if you're making out with a girl." … The Penguins have agreed to begin next season with a pair of games in Stockholm, Sweden. The Pens are expected to face the Senators. … RW Mark Recchi was a surprise healthy scratch on Thursday, but returned to the lineup Saturday against the Rangers.